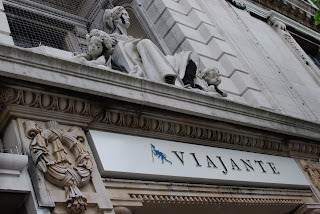 Earlier this week, as part of her ‘posh lunch’ project, Niamh of 'eat like a girl' invited me along to lunch with her at the newly opened Viajante, housed in the former Bethnal Green town hall. Nuno Mendes, the respected El Bulli and Jean Georges trained Chef is doing the cooking, and to be honest, it’s all very exciting, the food and the menus having evolved from Nuno’s acclaimed ‘The Loft’ project, a rather exclusive East London supper club. Arriving late, and slightly flustered (Tube delays, and suprisingly hot weather - for Britain, at least), I found Niamh waiting for me in the bar. The Restaurant itself couldn’t be in a grander building. We were greeted by Nuno himself, and ushered into the dining room, past the obviously busy, but eerily quiet open kitchen where, immaculately turned out chefs were meticulously assembling extremely complicated looking dishes; I knew we were going to be in for a treat. The dining room itself is decorated in a pleasant, contemporary style and feels fairly relaxed, we both decided to opt for the 3-course lunch menu at £25, and went for the added matched drinks option at £15. Can I just say right now, before I even begin describing what we ate. What a complete and utter bargain! 25 quid?!! Jaw droppingly good value. I couldn’t have been more impressed, and here’s why…. First up, a beautiful looking amuse consisting of a crostini dotted elaborately with dabs of romesco, gordal olives, almonds and Jerez. I’m not entirely sure what culinary trickery was used to produce the flavours. But it was almost as interesting to look at, as it was to eat, really quite delicious. 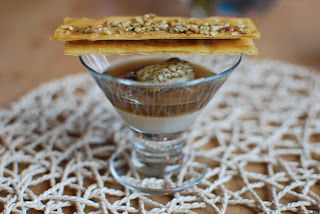 Next, another nicely assembled amuse of smokey aubergine with soy milk, this came with a filo strip containing aubergine puree balanced on the glass. To be honest, I wasn’t too sure about this dish. It looked a hell of a lot better than it tasted. I liked the filo strip component, but found the soy milk and aubergine jelly/custard a bit murky in flavour. No sooner had we finished this than another amuse arrived, the rather oddly named ‘Thai explosion II’, consisting of (I believe) chicken confit, crispy chicken skin and a quails egg, this was fresh, light and delightful to eat filling the mouth with classic Thai flavours, such as coriander and perhaps a hint of lemongrass. Very nicely cooked baguettes appeared next, with a mound of brown bread butter,sprinkled with chicken skin pieces and dusted with purple powder (no idea what this was, to be honest I found it quiet hard to keep track of exactly what we were eating as there were so many ingredients). Nevertheless It looked amazing, and tasted very good. The brown bread flavoured butter tasting somewhat surprisingly, of caramel and the actual bread itself being excellent. At this point our first matched ‘wine’ was poured, and it in keeping with the whole vibe of the fantastical menu, it was a Beer. Rodenbach from Belgium, which I must say was really nice, dark in colour, but fruity, light and alarmingly easy to drink. This was matched with a yet another beautiful looking plate, our starter of ‘Textures of beetroot’ consisting of Beetroot cooked three ways (Jellied, Pickled and in a errr …Ribbon, so raw? perhaps blanched?). This came with tiny heaps of green apple mousse, whipped goats curd and delicate flakes of crab. I loved it. Really subtle, fresh, flavours. It was a joy to eat. Plates cleared, our next matched plonk was a glass of Champagne. Duvel Leroy, 1999 Blanc de Chardonnay. Which was bloody good actually, really crisp. This was matched with Lemon Sole, on brioche, with mustard gnocchi and a yeasty cauliflower foam. Nuno Mendes came to our table and explained that this dish had been created around the champagne, and complimented it perfectly. Pouring a slick of the fish cooking juices around the plate, he made his was back to the kitchen and we tucked in. He’d nailed it. The Champagne worked perfectly with the food, beautifully paired. 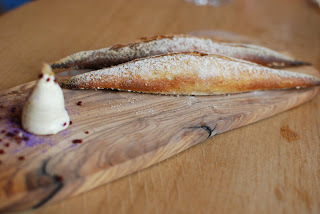 The food itself was superb, showing a real delicate hand with the flavours – really impressive. Thoughtfully, a spoon was provided to lap up the leftover subtle, buttery fish juices. Next, came an extremely refreshing Thai Basil and Lemon flavoured palate cleanser. This was seriously lovely, Thai Basil being a flavour I’ve never really enjoyed in the past to be honest, but here it was used with subtlety. Our final matched glass was a nice but strongly flavoured sweet dessert wine, which sadly, I didn’t catch the name of. This was paired with ‘Dark Chocolate and Water’. 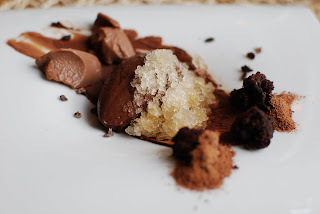 Another artistically arranged plate of chocolate in various forms, dust, jellied and mousse, served with a splash of coconut-flavoured granita representing the ‘water’ element. This was a masterstroke. 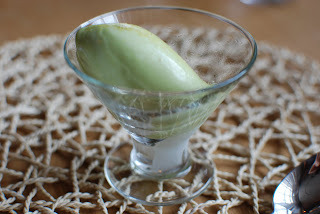 The chocolate by itself would be too cloying and dry, but the addition of the granita lightened it, and the texture of the cold ice against the warmth of the various chocolates was a revelation. This dish really worked for me. Finally, to finish off – we were given a small of bowl of crème catalana, and some beautiful petit fours, delicately flavoured Vanilla Pates de fruits, which were ok…and some scene stealing chocolate truffles, containing a white chocolate mushroom flavoured ganache. 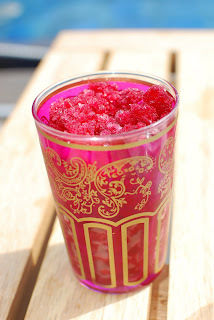 These were bloody delicious, and despite sounding a bit odd perhaps, the combination really worked well. Some nice coffee, served unusually with liquid sugar (new to me), and we collected the bill. All of that lot, food, plonk, tip….. £45 each!!! At that price, it has to be one of the best fine dining lunch bargains in London. The food itself was wondrous; admittedly not everything works, (aubergine with soy milk I’m looking at you). 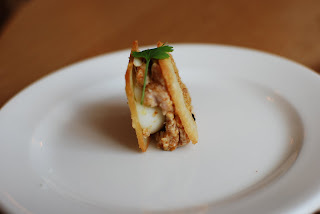 But then this is really unusual, almost experimental cooking, pushing cuisine to another level, and for that you sometimes have to take the smooth with a smidgen of rough. 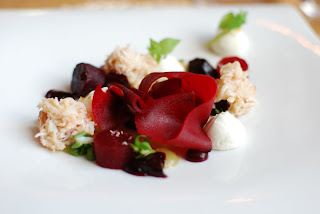 For all that, the food is very accessible, delicate and light with some incredibly interesting ideas and flavour combinations going on, and for that reason I cannot recommend lunch at Viajante enough. I’ve been meaning to try Chilli Cool in Bloomsbury for ages. Like the rather fabulous Tayyabs in Whitechapel, its one of those places London foodies are all aware of. Everyones been there, or if not, are planning to try it soon. What it also has in common with Tayyabs is it’s rather bargainous menu. But, there the similarity ends. 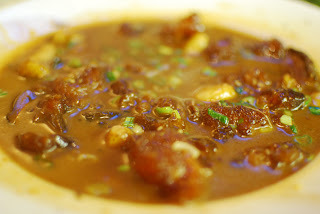 Tayyabs being purveyors of fine Pakistani cuisine, and Chilli Cool, Chinese – in fact, its much more specific than that. 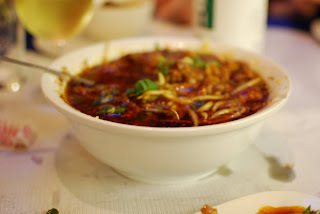 Chilli Cool specialises in food from the Sichuan province of China, which is famous for it’s spicy nature. Basically, nearly every dish is stuffed full of chillies. 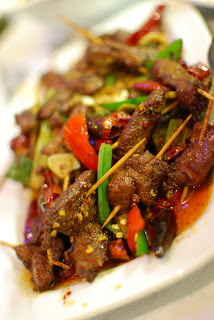 The other interesting element of Chilli Cool’s Szechuan menu is the liberal use of offal…. 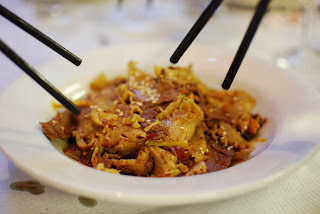 pig ears, beef tendons, various types of tripe – all feature heavily on the menu, which can be a bit daunting for the unitiated. To be honest, I was intrigued and just a little bit nervous about trying some of the dishes myself. But hey, what sort of food blog would this be if I didn’t eat the weird stuff? The restaurant itself is located in a quiet Bloomsbury street, and to be honest the frontage is a rather non-descript, very misleading….you could easily walk past and not really give it a second look. On entering, the interior is a lot nicer, modern, light and airy with a dining area in a glass extension to the rear. When we arrived and made our way through the restauarant every other diner in the place was Chinese, which was a good sign in my book. I was dining with a party of eight, which is perfect for somewhere like this, being able to order a lot of dishes to share and getting to try a good cross section of the menu. We all had a bit of input into what we wanted to try, but left most of the ordering to my good pal MiMi who had eaten there before and therefore knew what was good to eat. (allegedly). 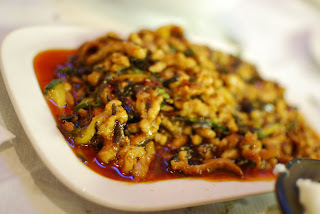 First up sliced pigs ears in sesame oil – which, I was expecting to be served hot. 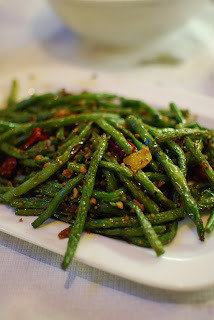 No, completely wrong footed – they were stone cold, and sliced thinly with a spicy sauce, if you didn’t know what they were, it would be hard to identify them, but and this is the main thing. They were bloody delicious. So good, with a suprising crisp, light texture. 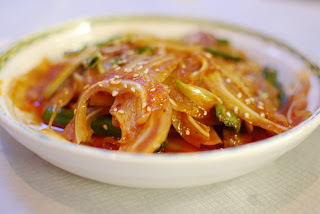 What followed was a succession of dishes, containing tripe, tendons and who knows what else and all having one thing in common; an almost exquisite heat from the numerous chillies. Not a horrible gasping for water heat, but a hard to define almost pleasant burn with a real subtelty of flavour. Presumably it must be something to do with the type of chillies used. 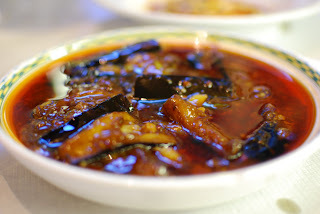 Everything was excellent, but the standout dish for me (somewhat suprisingly as it contained no meat) was the Sea Spicy Aubergine… it was frigging incredible. Just as I was wrongfooted by the cold pigs ears, I was completely surprised and stunned by the red hot oily sweetness of this dish. It was incredibly flavoured, I honestly don’t think I’ve ever eaten anything quite like it. I think this dish sums up nicely what makes Chilli Cool so good. 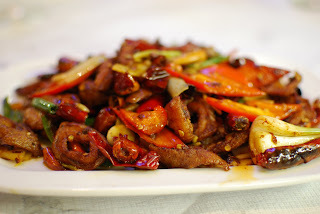 All of your expectations about eating Chinese food, about offal, about the temperature dishes are served, about the burn from chilis are utterly counfounded. The whole meal was a delight from start to finish, and I ate most of it in a state of complete wonder. It was bloody delicious, and when the bill finally came at the end of the meal, it was ridiculously cheap. (I seem to remember it coming it something like £25 a head, and we’d drunk our way through a hell of a lot of wine). 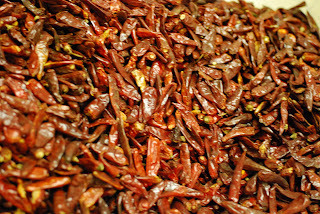 I can’t recommend Chilli Cool enough, it’s one of London’s real dining experiences, if you haven’t been, you have to try it. One tip though, don’t even think of wearing anything white if you don’t want it spattered in bright red chilli oil. 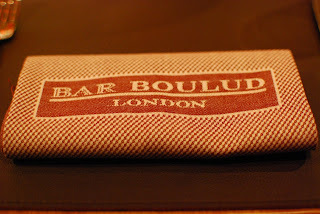 It’s not that often I get to visit restaurants when they’ve only been open for a few days, where the menu is still being tweaked and the paint is barely dry on the walls, but last night I ate at New York Chef, Daniel Boulud’s brand spanking new initial foray into the London restaurant scene ‘Bar Boulud’. Located in the Mandarin Oriental hotel, (Which is also soon to play host to Heston Blumenthals first London restaurant), Bar Boulud specialises in what could be best described as rustic French food with a New York slant. Chef Daniel Boulud has a serious reputation across the pond, and indeed globally to those in the know. His Big Apple flagship restaurant ‘Daniel NY’ has three Michelin stars, and was recently ranked eighth in a list of the best restaurants in the world. 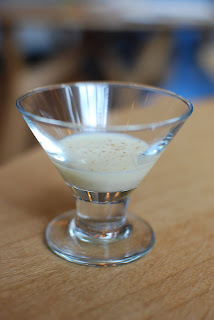 Naturally, being the serious gourmet that I am, I’d never heard of him before this week – but then I don’t visit too many 3* restaurants (OK, I haven’t been to any) and have only been to New York once, long before this blog existed. Nevertheless, I was very excited when I arrived and took my seat at the table, there’s a definite buzz about this opening and I couldn’t wait to see what the fuss was about. But, first of all – I just needed to withdraw my completely unobtrusive and discreet, massive Nikon digital SLR camera from its handy rucksack, and place it on the table with a definite ‘thump’. It wasn’t long, before one of the staff spotted it and enquired whether I was a journo – “No, food blogger/Dweeb*” I responded with a dazzling smile and flashing a used train ticket by way of introduction. My fellow diner, Chris of the blog ‘Cheese and Biscuits’ then politely asked whether it was ok to take photos. Expecting a cheery “Knock yourself out” – I was surprised to hear a bit of a lukewarm initial response, and a “Well, I just need to check with the chef first”. The “chef” being Daniel Boulud himself. Who, I had just noticed was overseeing operations in the open kitchen two metres from where we were sitting. A tense few minutes later, and we were informed – yes it would be OK to take photos but to please refrain from using the flash or taking snaps featuring our fellow diners. Fine with us. At this point our final dining companion Ben of ‘Food and Drink in London’ arrived, plonking down an even larger Nikon on the table, and we were ready to start ordering. We agreed to order a few dishes to share, before following up with a main each. So, first up was a charcuterie tasting plate. The pates and terrines featured are made on site, under the direction of ‘one of Frances most acclaimed charcutiers Gilles Verot’. As always, having my finger firmly on the pulse on all gastronomic comings and goings, I’d never heard of him, but after eating one incredible pate and terrine after another I didn’t need much convincing as to his skill. Really impressive, the provençal pulled rabbit and the shredded slow-braised beef cheek with onion confit and pistachio terrines in particular being incredibly good. 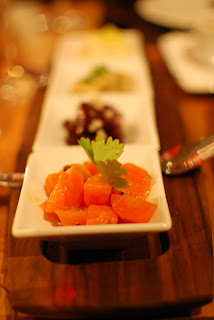 The platter came with a selection of rather nice hors doeuvres (beetroot with horseradish and hazelnut, carrots with coriander, celery-apple remoulade and mushrooms a la grecque), pickles and mustards, all of which were very tasty indeed. All in all, a great start. 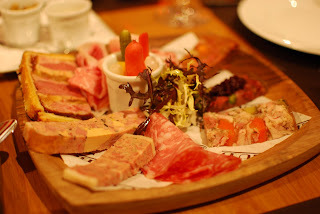 The charcuterie plate was pretty generously sized considering that three of us were tucking into a small platter. 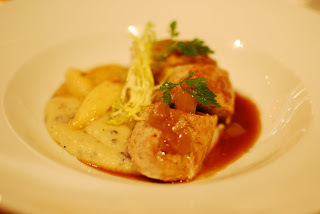 Next up, a dish of Boudin Blanc, truffled white sausage with mashed potato. This was delicious, the sausage being almost as soft and creamy as the accompanying beautiful mash. I liked this dish a lot. As we were finishing up our starters, a dish of Rillons croustillants au poivre - crispy and tender pork belly with cracked pepper appeared on the table ‘compliments of the chef’ – (it appears the large cameras and an apparent Google search of Chris ‘Cheese and Biscuits’ who had made the reservation was paying dividends here). 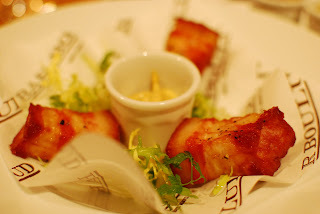 These were really rather tasty, thick rustic squares of tender pork belly with some Dijon mustard for dipping…what’s not to like about that? Ordering our Mains – Coq au Vin and Roasted chicken breast with wild garlic potatoes and artichokes respectively for my dining companions and the DBGB Piggie burger for me (so called because it contains BBQ pulled pork), we sat back drank wine and chatted. 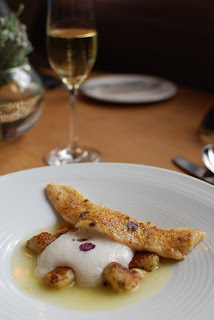 At this point a smiling Daniel Boulud came out of the kitchen and over to our table, shook our hands and asked us what we’d thought of the food, and indulged us in some general chitchat about our respective blogs. He came across as a really pleasant, genuine guy. It was a really nice touch and it’s great to see a chef of his calibre actually in the kitchen overseeing operations. Insisting that we try ‘The Frenchie’ burger as he returned to the kitchen, our mains arrived. 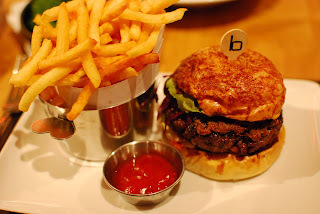 As regular readers know, I’ve got a real love of a decent burger and the offerings at Bar Boulud don’t disappoint, my ‘Piggie’ burger, cooked medium as specified was perfectly constructed, and beautifully loose and moist with a really good brioche bun. The accompanying fries were really rather good as well. If I’m honest, I still prefer the Burger at Hawksmoor and more recently, a offering at Bob Bob Ricard, but.... that is until the promised ‘Frenchie’ burger (who’s main defining characteristics are confit pork belly and Morbier cheese) was sent out from the kitchen for us to sample, cut into three pieces. It was cooked medium rare, and it was bloody delicious far, far better in my opinion than the ‘Piggie’ burger that I’d ordered. I’ll have to return to sample a whole one to be sure, but it could be a real contender for best burger in London. 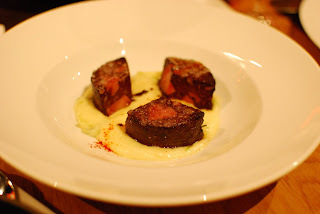 A plate of Boudin Noir with mash was sent out for us to sample, and like the Boudin Blanc from earlier in the evening it was extremely well cooked, silky smooth and tasty, working very well with the mash. At this point I was stuffed silly. 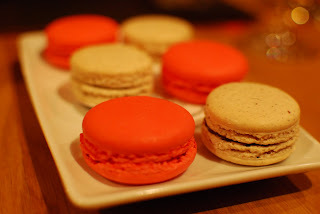 So much so in fact, that for once – I just couldn’t face dessert, the table agreed – dessert was out…but some extremely subtle up-selling by our waiter saw us giving in and ordering a round of macarons to finish off the meal. The strawberry flavour was pretty good, and it was commented upon around the table that it had a ‘jammy dodger biscuit’ flavour to it. The Hazlenut macaron was much nicer, really very good…. although perhaps, not Pierre Herme good. (Of whom it must be said was visiting the restaurant later that evening as a guest of Daniel Boulud, along with seemingly just about every chef worth his salt in Britain and Paris – the guest list we caught a glimpse of, reading like a who’s who of world class chefs). Settling up and another chance to exchange a few words and shake hands with a cheery Daniel Boulud and his restaurant manager, I left feeling extremely happy with the food I’d just eaten. The various terrines and pates on offer are very good indeed the Boudin blanc is bloody delicious and the burgers are excellent, particularly in my opinion the ‘Frenchie’, which based on what we were served is perhaps best eaten medium rare. A quick word about the service, it was impeccable. Some of the key staff apparently being transplanted from New York to ensure a smooth opening, and it showed. I think the highest recommendation I could make is to say that without a doubt, I will be visiting Bar Boulud again in the future. *For explanation of Dweeb – See link ‘Here’. It’s not often that I can say I've eaten somewhere before one of the top tier food journalists pays a visit. But just this once, I’m rather smug and self satisfied in saying that I’d visted Bristol’s Lido a couple of months before Jay Rayners review this week. (Although, admittedly, its been open for quite a while). When I visited back on an unseasonably hot day in February it was only to sample the desserts. 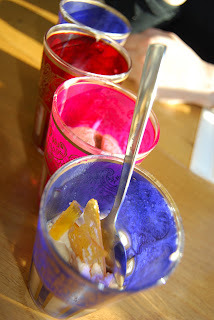 The ice creams served in Moroccan glassware are rightly lauded, and I sampled half portions of more or less, the lot. Without exception they were all lovely, although the Pedro Ximenez & Raisin and Salted Butter Caramel flavours were particularly good. I left extremely impressed, and knew I’d have to come back and try the food proper at some point. And so, at the beginning of this week on a beautifully cloudless hot spring day I rocked up for another bash at the menu. The Lido itself is an interesting place. Dating from 1850 and just escaping the wrecking ball by the skin of its teeth, (It was scheduled for demolition to make way for flats until fairly recently), it has been lovingly renovated and is now a fantastic place to go for a swim on a hot day. The restaurant proper is upstairs with views of the pool itself along one entire length of the room, there is also a bar area downstairs and decked areas outside where you can sit and eat metres away from the strenuous water splashing activities of the more virtuous. The menu has an interesting, Middle Eastern slant to it. The Head Chef Freddy Bird having spent some of his career at Moro in London, and looking down the list of dishes, the influence has clearly rubbed off. A wood roasting oven features heavily and sitting outside, basking in the sun on the decked area by the pool – tantalising aromatic wafts of exotic wood roasted delights drifted around me, in fact – if I didn’t know different, with the sun and the beautiful food aromas I could have sworn I was sitting outside somewhere in the Mediterranean, there’s a definite elusive holiday feel to the whole experience. Adding to the happy vibes, at lunchtimes there’s a two courses for £10 offer on, consisting of small plate starter and a main courses, it’s a bit of a steal. 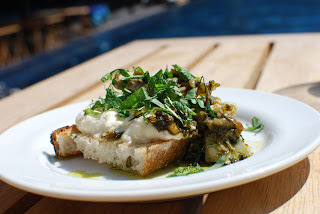 The pool and azure blue sky reflecting in my Sunglasses, I sipped lazily on my pint of lager, and tore into the rather good proffered bread and olive oil whilst awaiting my starter of Labneh, slow cooked artichokes and sweet herbs on toast. (Labneh in case you’re unfamiliar is Arabic strained yoghurt). Despite it being a smaller version of the standard menu dish it was perfectly sized for a starter. The whole plate of food was tasty, light and fresh and it didn’t take me long to finish it off. Meanwhile dining companion ‘E’ was tucking into Salt Cod Croquetas with aioli. 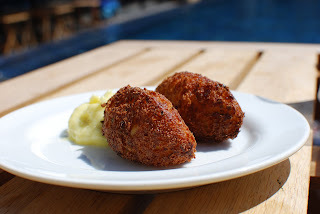 These were also very good, crisp with a nice salt cod flavour, complimented well by the garlicky splodge of aioli on the side. Plates cleared and impressed, I returned to lazing as a handful of swimmers shattered the surface of the sun-dappled pool with their exertions. 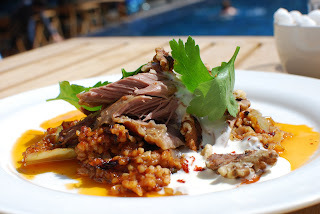 My main of Slow Roast Shoulder of Lamb, Cabbage, Tomato and Bulgar pilaf, Walnuts and Yoghurt arrived, and it looked bloody fantastic. I thanked my good fortune for taking advantage of the bargainous lunch deal. I’ve cooked a few things from the various Moro cookbooks and the influence in this dish was apparent from just one taste. It was gorgeous, the rustic looking lamb was tender and beautifully cooked, the whole plate of food was very impressive and the highest praise I can give is by saying that I really, really enjoyed eating it. 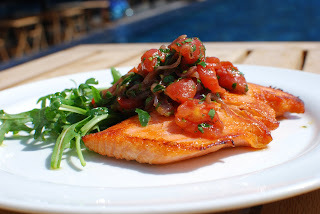 ‘E’s plate of Seared Trout, warm cherry tomatoes, muscatel vinegar and red onion looked equally impressive, and was “very good”, although she also said that it could have done with just a bit more cooking, the very middle being slightly undercooked. 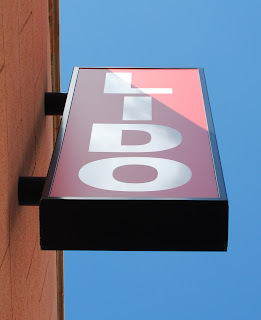 While we were eating, the majority of the Lido’s restaurant staff were taking part in some kind of medical training, leaving the two waiters on duty running around and looking a bit harassed. Subsequently our side dish of wood roast potatoes was forgotten, and although the waiter apologised profusely upon realising the error and said he’d get them out as soon as possible, they arrived after we’d finished our food. We ate them anyway. They were pretty good, and to the waiter’s credit, he took them off the bill without being asked which is an indication of good service. It had to be ice cream for dessert, and I went for the White Chocolate with pomegranate syrup flavour. ‘E’ chose a Blood Orange Granita. 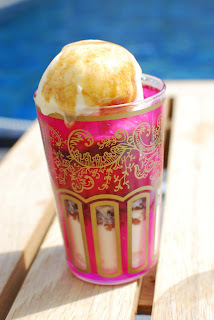 As when I’d eaten here before, these came up in Moroccan style glassware, and although to my mind £5.50 for ice cream may appear to be a bit steep, the flavours are so bloody nice and the portions so generous I can see why they are priced as they are. What else is there to say other than The Lido is a rather lovely venue to spend an afternoon at, eating and drinking. Extremely pleasant, especially if the sun is out. I’d imagine on a balmy summer evening it would be an equally attractive place to while away the hours. The food is interesting, imaginative and very nicely cooked. I love the Middle Eastern vibe and despite the couple of minor niggles mentioned, I left very happy with the lunch I’d just eaten. Oh, and once again – the two courses for £10 lunch deal is a serious bloody steal. If you’re in the area, you have to take advantage of that! Errr, yes – so Cheeks… My next attempt would be of the Ox variety. Waitrose is currently championing ‘forgotten cuts’ and amazingly for a supermarket chain, they don’t appear to be cashing-in on it. Three shiny pound coins bought me two surprisingly hefty Ox cheeks, weighing them in my hand; I slinked away from the counter feeling like I’d just purchased the meat bargain of the century. Little did I realise what trouble they would cause me, as I squirreled them away in the freezer for some future cheek action. Bounding from my pit in an irritatingly good mood and declaring that today of all days would be “cheek day” – I retrieved the meaty parcel from the freezer to defrost. At this point, I had no idea how I’d cook them…. I hadn’t even considered it. I knew that Ox cheek is a cut that needs a long slow cook, and I was thinking a few hours…. as far as I was concerned, I had loads of time…. Later that morning, with the cheeks half defrosted, I finally got around to checking a few recipes and was alarmed to find that nearly all, without exception require the cheeks to be marinated overnight to soften them up and even then they still need some serious cooking. Dinner at 10pm was looking like a real possibility, until at my wits end I came across a recipe in Gordon Ramsay’s Great British Pub Food. 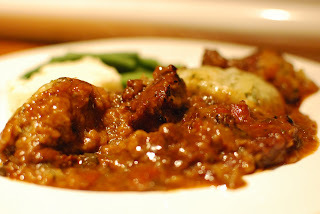 ‘Beef cheeks braised in stout with dumplings’. The cheeks are cut into chunks and braised in a combination of stout and stock for three and a half hours. I decided this was eminently doable. But, what? Beef or Veal stock needed, having none to hand and deciding that in order to do my cheeks justice only the real deal would do. I decided to make my own stock. Running down to the butchers, and purchasing some veal bones I got the stock on. It took bloody hours, but there’s something very satisfying about making a product so useful from inedible bones and a bit of veg. So, Six hours later and my Veal stock done, I was ready to begin cooking the Ox cheeks for three and half hours. At this point I was starting to think this better be one of the best things I’ve ever made, because its taken nearly a whole day to prepare. Small handful of mixed herbs, such as parsley, chives and chervil, chopped. Trim off any excess fat from the cheeks and cut into bite-sized pieces. Mix the flour with a little salt and pepper and use to lightly coat the beef pieces. Heat a thin layer of olive oil in a heavy-based flameproof casserole. Brown the beef in batches for 4-6 mins, turning to colour evenly, then remove to a plate. Drizzle a little more oil into the pan and add the vegetables, along with the bay leaves and thyme. Stir in the tomato puree and sugar. Cook, stirring frequently, over a high heat for 6-8 mins until the vegetables begin to soften and colour. Pour in the stout and let bubble for 5-10 mins until reduced by about half. Return the meat to the pan. Add the stock to cover the meat and vegetables. Season well, bring to the boil and put the lid on. 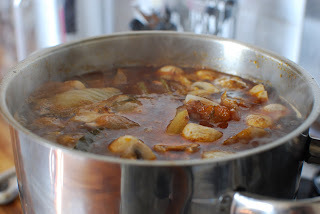 Simmer gently for 3-3 ½ hours until the beef is just tender, stirring every once in a while. Taste and adjust the seasoning. 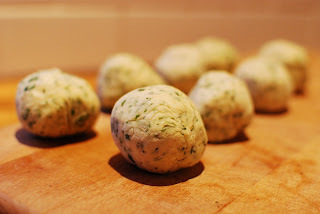 Meanwhile, to make the dumplings, put the flour, suet, salt and a good pinch of pepper into a large bowl. Mix well, then stir in the chopped herbs. Make a well in the centre and add the creamed horseradish and 4 TBSP of water. Mix to a firm dough that comes away from the sides of the bowl cleanly. If it is a bit dry, add a little more water. Turn the dough out onto a clean board and sprinkle over some flour. Roll the dough out into a sausage shape, then divide into 8 balls. 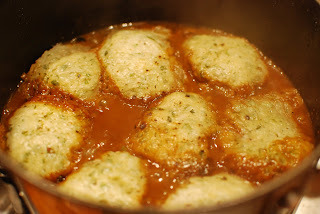 Carefully drop the dumplings into the stew, spacing them apart to allow for them to double in size during cooking. Replace the lid and cook for a further 20-30 mins until the dumplings have puffed up and are light and fluffy. 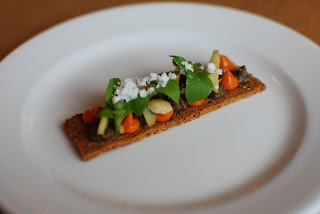 Serve with seasonal vegetables. So, after Ten hours of faffing about making veal stock and then slow cooking the ox cheeks in stout…. was it any good? Although I ended up eating dinner at 9pm, It was bloody gorgeous. Stupendously good. In fact, one of the best things I’ve ever cooked. The meat was melt in the mouth tender, falling to pieces at merest touch of the fork. It tasted incredible. 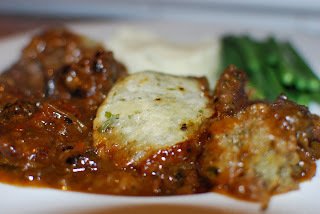 The surrounding stout stew was dark, rich and tasty, and the herb and horseradish dumplings were a revelation. 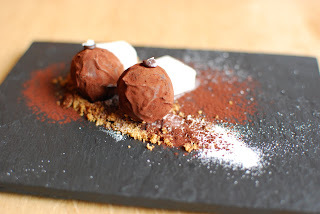 So light, and so distinctly flavoured, they were the perfect accompaniment to the Ox cheeks. I’ll definitely be making these again to use in other stews. So, my verdict on ox cheeks, if you’ve never tried them then you’re missing out. £3 for two cheeks to cook a dinner for four is making out like a bandit! Seriously good value for money, and seriously tasty. So, if you see them - snap them up!